"What could be a more unlikely breeding ground for noir fiction than Montana, whose wide-open landscapes seem the polar opposite of the mean streets of Los Angeles? Yet certain noir standbys prove both malleable and fertile in these 14 new stories...If Montana has a dark side, is anywhere safe from noir?" "Terrific...Montana Noir is one of the high points in Akashic's long-running and justly celebrated Noir series...Editors Grady and Graff's selections...are all sharply attuned to their settings and to the ways those varying landscapes reflect the darkness within the people who walk the streets or drive the country roads." "14 stories set in Big Sky Country. Much like a travel map that divides Montana into regions, this volume is partitioned into four sections that reflect the geography of the state: Copper Power, The Hi-Line, Custer Country, and Rivers Run...Montana, and others live in the state; all the authors have strong emotional ties to the area's particular lifestyle. 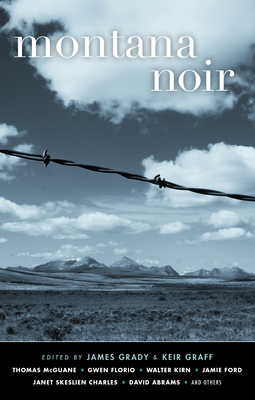 The editors tout this book as the first-ever anthology of Montana-set noir short stories. Fans of the genre and regional fiction will be intrigued." "There's no shortage of misbehavior in this book. But there's also no shortage of excellent writing by some of Montana's finest authors. The book included work by Thomas McGuane, Jamie Ford, Walter Kirn, Debra Magpie earling and eight others. Thwey're all Montanans, every one, and their subjects are as varied and unique as the state itself." "Even though Montana's beauty makes the idea of dark alleys and neon lights seem incongruous, noir also represents struggle, and doing the wrong thing for the right reasons...There can never be a happy ending in noir but there can be the possibility of redemption. It's the little guy against big forces and as Montanans, we can all appreciate that fight." Akashic Books continues its award-winning series of original noir anthologies, launched in 2004 with Brooklyn Noir. Each book comprises all new stories, each one set in a distinct location within the geographic area of the book. Grady and Graff, both Montana natives, masterfully curate this collection of hard-edged Western tales. Brand-new stories by: David Abrams, Caroline Patterson, Eric Heidle, Thomas McGuane, Janet Skeslien Charles, Sidner Larson, Yvonne Seng, James Grady, Jamie Ford, Carrie La Seur, Walter Kirn, Gwen Florio, Debra Magpie Earling, and Keir Graff. This anthology is a road trip through the dreams and disasters of the true Montana, stories written by authors with Montana in their blood, tales that circle you around the state through its cities and small towns. These are twenty-first century authors writing timeless sagas of choice, crime, and consequences...You'll meet students and strippers, cops and cons, druggies and dreamers, cold-eyed killers and caught-in-their-gunsights screwed-up souls. But mostly, through all our fiction here, you'll meet quiet heroes and see the noir side of life that makes our Montana as real as it is mythic. No doubt the state's beauty will still make the very idea of Montana Noir seem incongruous to some. Noir is black-and-white. Streets and alleys. Flashing neon lighting a rain-streaked window. But while noir was definitely an urban invention, it knows no boundaries. Noir is struggle. It's doing the wrong thing for the right reasons. It's being trapped. It's hubris. It's being defeated yet going on. Sometimes it's being defeated and not going on. That's life everywhere. This is our Montana. James Grady was born and raised in Shelby, Montana. His first novel, Six Days of the Condor, became the iconic movie starring Robert Redford.Keir Graff was born and raised in Missoula, Montana. He is the author of four novels for adults (most recently The Price of Liberty), and two novels for middle-graders. Graff now lives in Chicago, where he is the executive editor of Booklist.